A variety of high quality screensavers and virtual aquaria to brighten-up your desktop. Click the pictures to go to the publisher's site / download from here. Scroll down for "Aquaria and Tropical Fish", "Watches, Clocks and Time", "Holidays / Seasonal" and "Action / Adventure, Nature / Fantasy". Designed by Academy Award-winning, Hollywood special effects guru Alan Kapler, Dream Aquarium is the most realistic virtual aquarium available today. The beautifully-rendered freshwater fish have fully-animated fins, eyes, mouths and gills, exhibit life-like behaviour including shoaling, darting and feeding and swim through highly realistic 3D habitats. You can even add extra tanks with your own 2D backgrounds. Registered users of Dream Aquarium can download the latest beta versions which Alan makes available from time to time and which often feature new fish not available in the general release (the latest Angelfish varieties are absolutely beautiful). Forum members often make 2D backgrounds available for others to use for free. Update 20/03/2011 - the latest beta version of Dream Aquarium allows you add 2D backgrounds to the 3D tanks which add a real extra sense of depth (video 61 secs / 7.9MB). Watch another video (1m 58s / 13.6MB). Download Trial version. Created by Master Artist, Jim Sachs, Marine Aquarium 2 set the benchmark for virtual aquaria some years ago. Now, Jim has raised the bar by releasing his current work-in-progress, Marine Aquarium 3. At the time of writing, Jim is still working on new fish models, but already Marine Aquarium 3 takes this virtual aquarium to a whole new level by virtue of the stunningly realistic new 3D tank. The new tank is very wide and scrolls from side to side. It is perhaps best viewed on systems with multiple monitors. Much of the flora and fauna in the new tank is now fully animated and reacts to the fish as they swim by. The tank also features a crystal which can display a clock/calendar or even a custom-designed logo of your choice. As well as the new fish models to look forward to, Jim also plans to add "creature packs" which users can add as they wish. Watch a video (1m 6s / 6.9MB). Download Trial version. If you prefer open ocean scenes to an enclosed aquarium tank, take a look at Aqua Real 2. A huge variety of selectable fish species swim freely through a range of splendid ocean habitats including underwater caves, coral reefs and ship wrecks, with only the occasional squabble between the more aggressive species and the appearance of the odd shark to disturb the tranquillity. Aqua Real 2 allows you to feed the fish, interact with them by clicking on them with your mouse and you can choose your own background music too. Download Trial version. Much more than a mere screensaver, Virtual Reality Aquarium is almost like owning a real aquarium but without the expense! You begin by designing your own aquarium tank from a huge library of 3D objects including rocks, plants, wood, ornaments, shells, coral and more, all of which you can place anywhere you like. You can rotate the objects and resize them; the possibilities are almost endless. Once you've designed your aquarium, visit the marine pet shop to select some fish to populate your tank. Make your selections with care! Choose too many aggressive species and there will be a lot of fighting in your aquarium. Don't forget to select a healthy mix of males and females if you expect them to breed! Over-populate your tank and water pollution will be a constant problem. Consult the built-in encyclopaedia to help you choose. After making your selections and placing them in your tank, you must feed, care for and nurture your fish to maintain their health and watch them grow to adults whereupon they may begin to breed. If you do a god job and keep your fish healthy and happy, you may receive a surprise visitor to your tank! Download Trial version. A tropical island paradise. Beneath the gently rolling waters beautiful fish play amongst the coral, only disturbed by the occasional shark. Pleasure craft navigate the lagoon's surface waters whilst palm trees on the sandy beaches sway in the gentle breeze and birds wheel in the blue skies overhead. Very relaxing. Can optionally run as animated Active Desktop wallpaper. Download Trial version. A wrecked galleon lies forgotten at the bottom of the sea, undiscovered except by the marine fish that have made it their home. Download Trial version. Peer down into the water and watch the Koi Carp gliding gracefully beneath and sometimes nibbling at food on the surface. An occasional dragonfly will buzz by too. Download Trial version. Wonderfully surreal desktop aquarium screensaver from Robert Bates of uselesscreations.com. Your monitor slowly fills with water and becomes populated by a variety of marine and/or fresh water 3D fish. Versions for Mac OS X and Windows are offered with the latter being available in both OpenGL and DirectX versions. I found the DirectX version worked best for me. More than twenty species of fish are available to registered users. Watch a video (47 seconds / 6MB). Download Trial version. A rich and colourful tropical reef plays host to a wide variety of marine fish. Download Trial version. A great fun aquarium simulation by Kirk Baucom for those of us that fondly remember the days when computers had simple text-based terminals and we enjoyed playing games like Rogue and Nethack! ASCIIQuarium depicts an open ocean scene with a wide-variety of fish, sea creatures, ships and other objects using nothing more elaborate than ASCII characters! Retro-fans will love this. Linux and Mac only screensaver versions are available based on Kirk's Perl script. FREE. A special mention must go to the latest version of SimAQUARIUM by Digital Illusions. The newly-released SimAQUARIUM 3 is a huge step forward from the previous version providing a truly immersive tropical reef simulation. There's even an anaglyph 3D mode! Be warned though that you'll probably need a good graphics card to see this screensaver in all its glory. I tried it on a laptop with a Mobile Intel(R) 4 Series Express Chipset and got a lowly 10.5 frames per second. On an almost identical laptop with an nVidia Quadro NVS 135M graphics card I couldn't get the screensaver to run at all and had no luck either on an elderly desktop with an nVidia Riva TNT2 Ultra. But maybe I was just unlucky, it's definitely worth giving this one a try. NEWS UPDATE: 7th. August 2011 - The latest version of SimAQUARIUM (3.1 B27) is now able to run satisfactorily on far less powerful graphics cards than it previously required. It does mean sacrificing a few of the more advanced features but testing reveals that it still looks great and I now get more than double the frame rate than I could on the earlier versions. It's a very worthy addition to any aquarium simulator collection. Download Trial Version. If you love mechanical clocks and watches then this screensaver is for you. It's a highly-detailed, chiming mechanical clock that displays a fully-working, mechanism. Can optionally run as animated Active Desktop wallpaper. Download Trial version. An amazing close-up view inside an extraordinary multi-module digital clock that almost gives the viewer the impression of being inside one of the vast Krell machines from Forbidden Planet! The clock contains complex wiring looms and circuit boards with detailed electrical components and vertical rails along which modules containing different types of digital clock technology are raised and lowered. There are LCD's, modern OLED's, traditional red LED's, an old style flip-clock, oscilloscope modules and, my favourite, Nixie style valve modules. The hour, minute and seconds modules can even be mixed and matched. Watch a video (1m 29s / 6MB). Download Trial version. A water-driven clock with a highly-detailed, fully-working mechanism. The lighting on this screensaver changes throughout the day to match dawn, daytime, dusk and night time. As night falls the clock is subtly illuminated and fireflies flicker around the dial. Download Trial version. A mysterious chiming clock made from blocks of ice floating in a running stream. If you watch closely you will spot Koi Carp swimming underneath. Download Trial version. One of my personal favourites, the Cuckoo Clock is very Tolkien-esque. A gnarled old tree stands in the middle of a forest clearing. Someone has mounted cuckoo clocks on the tree and forest birds sit in the boughs appearing to stand guard. A live cuckoo pops out of one of the cuckoo clocks on the hour and half-hour to signal the time. From dawn through to dusk the sun moves across the sky and birds can be heard singing in the tree and the surrounding forest. As day turns to dusk, lanterns in the tree are lit and the clock dials become illuminated. As night falls, the moon rises and the birdsong is replaced by the howling of wolves from deep within the forest! Very atmospheric. Download Trial version. Very similar to the Coral Reef screensaver above, this one replaces the sunken galleon with the ruins of an ancient clock tower that perhaps once stood in a mighty city swept away by rising seas long ago. Strangely, despite being inundated with all that corrosive salt water and seaweed, the clock is still working perfectly! Download Trial version. A marvellously architected clock tower standing in the centre of a city with the constant murmur and hubbub of the townspeople below punctuated by the chiming of the bells in the clock tower. This is another beautifully-lit screensaver where dawn gradually changes to dusk in real time. Download Trial version. A careless traveller has a hole in his pocket and has dropped this charming pocket watch and some spare change in a stream! The watch is still running so he can't be too far away! Download Trial version. Oh dear, our butter-fingered friend above has passed this way again and dropped another watch, more coins and his door keys this time! He really should learn to be more careful! Download Trial version. An astrological marvel with whirling constellations and signs of the Zodiac, Download Trial version. 14 bundled clock screensavers including Yugo Nakamura's hand-written clock, InsertMonkey's TimeLine, a classic European railway clock that's also very much like a Mondaine watch or the new Smiths "Big-Date" PRS-27 from Timefactors, a traditional clock with Roman numerals and sub-seconds dial and eight other clocks by Charles Salim that include a Mickey Mouse and Hans Donner's Tme Dimension. FREE. Very similar to Yugo Nakamura's hand-written clock (incorporated in the AJ Screensaver above) this one is, I think, by the same author and illustrates time by creating towers from building blocks. FREE. This screensaver mimics the early digital watches in which hours, minutes and seconds are displayed on rotating discs viewed through a window. FREE. One of my favourites, this clock is more a work of art than a screensaver. High-speed (slow motion) photography has been used to show numerals representing the time falling into water, creating splashes on the surface, and sinking slowly to the bottom. Trial versions for Mac or Windows. This screensaver accurately mimics an old style digital desk clock where the printed numbers flip over. FREE for Mac OS X or Windows. Neat 3D clock screensaver with four different themes: "Golden Pocket Watch", "Old Wall Clock", "Sci-Fi Clock" and, my favourite, "Fashion Watch". Requires Microsoft .NET Framework 2.0 and 3D graphics card (anything above an old NVIDIA GeForce 2 should be fine). FREE. Small, but perfectly formed, this neat little clock by R. T. Russell was programmed in BBC Basic. You can select between an "antique" (pictured) or "modern" style with "ornate" or "classic" hour/minute handset. The action of the seconds hand can be adjusted to mimic different movement types too. Just drop the 170KB .scr file into your \Windwos\System32 folder and then adjust the screensaver from Windows' Display Properties settings as normal. FREE for Windows. It's not especially easy to tell the time with this one but I like it because it's use of changing colours draws a little from the Tian Harlan Chromachron. Concentric arcs illustrate the passage of different measures of time (seconds, minutes, hours, day, date and month, moving from the outermost to innermost arc by default, although this is configurable). The arcs move clockwise as time elapses and gradually change colour as they do so from Cyan at 0/360 degrees, through mauve at 90 degrees, orange at 180 degrees and lime green at 270 degrees. FREE for Mac OS X, iPhone, or Windows. Perhaps not the best example of a screensaver, as such, Pong Clock is nevertheless a worthy addition to any virtual computer clock collection. The score display is used to show the current time in this representation of the venerable computer game. FREE for Windows and Mac. 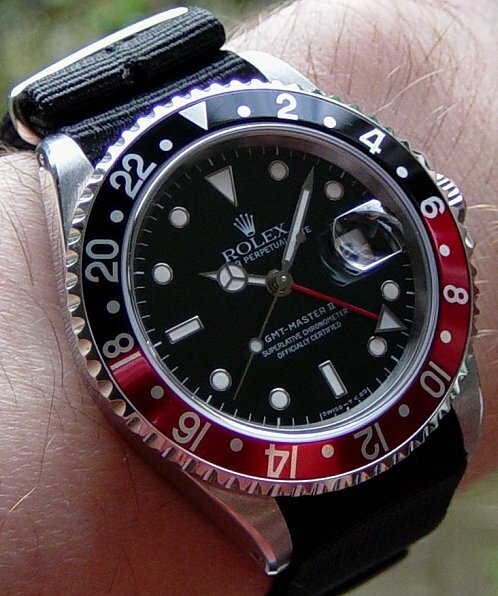 A rather splendid version of the Rolex GMT-Master II, just like my real one! I got this ages ago from the TKF TimeKeeperForum but I can't remember if they had any others. Why not pay them a visit and have a look around! FREE. I must also point out that Rolex themselves provide some wonderful, very realistic screensavers based on the various models from their current collection, so don't forget to check them out too. There are lots of these types of clocks available. They show the passage of day/night across the surface of the earth and function as rather neat world clocks. This one by Map Maker is by far the best and most comprehensive I've seen. There are lots of versions (some free, some not) so head on over to Map Maker's Sun Clock page and choose the one that's right for you. A 3D carousel of charming Christmas tree decorations with an optional sprinkling of gently jingling bells and traditional music. Perfect for a festive desktop. Download Trial version. If the more traditional Christmas Bells screensaver above is not your glass of Port, how about this jazzier screensaver featuring a fully-animated snowman who likes to let off fireworks and play much livelier music? Download Trial version. It's Christmas Eve. The tree is decorated and the stockings are hung waiting for the arrival of Santa Claus. But don't forget to put out the fire before he climbs down the chimney! This is a great Christmas screensaver that features candlelight, a roaring fire and a chiming clock bauble hanging from the Christmas tree that tells the correct time. Download Trial version. What better way to relax on a cold winter's evening than to settle down in front of your computer... and a roaring, log fire! No need to chop down any trees and haul them home. No need to clear out the hearth and grate the following morning. Although this screensaver doesn't give out any more heat than your computer would do normally, it certainly feels warm! Can also run as animated Active Desktop Wallpaper. Download Trial version. For those of you that remember "Doom", this has all the hallmarks of one those particularly troublesome levels. Jabbering Jack-o-lanterns, fiery skulls and all manner of dreadful manifestations inhabit this infernal world. Download Trial version. A perfect candidate for Mystery Inc. this spooky screensaver is great for Halloween and fun at any time of the year. A lowering sky and full moon cast sinister shadows about the old haunted mansion house and surrounding cemetery. Wolves howl, ghouls moan and crows caw as bats wheel overhead. Watch out for the very creepy janitor who prowls the grounds looking for pesky kids! Download Trial version. Christmas is coming and the townspeople of this charming village are making the most of it with wonderful village decorations, firework displays and ice skating on the frozen river. Download Trial version. Summer is here and the townspeople are out and about soaking up the sun. Take a stroll through the village and bask in the friendly atmosphere and watch the people boating on the lake and canoeing along the shoreline. Download Trial version. It may not be Valentine's Day today but, if you're in a romantic mood why not show it by adding this screensaver and animated Active Desktop wallpaper to your PC? Two lifelike, decorative, heart-shaped balloons float above a floral backdrop, entwining in the gentle breeze and reflecting the delicate sunlight. Download Trial version. Two crystalline hearts entwine above a bed of roses. Download Trial version. Whether you're the romantic type or not, this is nevertheless an excellent screensaver. A mechanical music box plays in centre stage, surrounded by red roses, pink hearts and fluttering butterflies. The graphics are excellent but what's really cool about this screensaver is that it contains a picture frame which can display an image file from your computer and you can even select your own music, making this screensaver perfect as a gift for someone special. Download Trial version. I love this one which also works as animated Active Desktop wallpaper. We're standing at the edge of the forest at dusk in the depths of Winter. Snow gently falls around us as we look across the river to the village on the opposite bank. As we wait patiently and quietly, forest animals come and go, undeterred by our presence. Download Trial version. Amazing views in and around a medieval cliff-top stronghold whose walls have seen times of siege and conflict but also days of feasting and merrymaking. Download Trial version. Wonderful 3D representation of the famous US battleship USS Missouri, otherwise known as "Mighty Mo", which saw nearly fifty years of service since World War 2. Currently serving as a museum ship at Pearl Harbor, with this screensaver "Mighty Mo" can take to the seas once more. Download Trial version. Chocks away and tally-ho! Take to the skies of northern Europe with the Royal Flying Corps and get a feel for what it must have been like to fly these classic WW1 biplanes. Keep your eyes peeled for Von Richthofen and Zeppelins! Download Trial version. This one rather reminds me of Khazad-d�m, the city of the Dwarves, also known as Moria or Dwarrowdelf from Tolkien's epic fantasy The Lord of the Rings. Here though, cunningly crafted imperishable crystal replaces hewn rock in the structure of the halls, columns and arches. The glistening firelight is reflected off and refracted through the crystal to stunning effect if you have a powerful enough graphics card to run this screensaver at its full potential. Gimli, son of Gloin, would be proud! Download Trial version. An artistic impression of the wonders of the universe. Splendid space stations, fearsome quasars and treacherous asteroid fields are some of the sights you will see if you choose to boldly go where no one has gone before! Download Trial version. This is one of my personal favourites as it has an almost unique charm. We're in the study of a medieval explorer where subtle candlelight illuminates the surroundings cluttered with journals, charts, papers, a globe and other paraphernalia. A working pocket watch shows the correct time and a picture frame adorns the desk in which you can change the picture displayed for an image file stored on your computer. A quite beautiful screensaver that makes a refreshing change to the norm and that would make a great gift for someone of a nautical persuasion. Download Trial version. Mingle with the villagers in this lovely, medieval Dutch settlement, gaze at the wide blue sky and marvel at the wonderful windmills. Download Trial version. A superb "virtual globe" in which you can view the Earth as seen from space by astronauts on board the Space Shuttle and International Space Station. There are lots of features to play with in this screensaver which also features an interactive mode where you can stop merely orbiting the globe in a prescribed path and simply grab hold of the Earth and spin it around to any area you wish to view. Download Trial version. I really like this one because it genuinely manages to conjure a fantasy atmosphere whilst only requiring modest computer graphics power to run. This is a whimsical screensaver that might also fit a Halloween theme. Some mysterious creature (a gnome or goblin perhaps) has built a dwelling in the hollow of an ancient tree. We view the scene in the dead of night by spooky lantern light and the glow of the fantasy moon! Download Trial version. Those of you old enough to remember rock bands like Yes, Budgie and Greenslade will be familiar with the album cover artwork of Roger Dean featuring exotic, fantasy landscapes. This screensaver is evocative of those images, set on a distant alien world with vibrantly coloured flora, gravity-defying mountain peaks, mysterious pools and lurid skies filled with many strange moons and swollen stars. Download Trial version. A placid lake reflects the dawn sun diffused through the early morning mist. Birds and insects are beginning to awake and fishermen set out in their boats in the hope of landing the best catch. As beautiful as it is as a screensaver, I think this one is at its best in animated Active Desktop wallpaper mode. Download Trial version. Fly the flag! A wonderfully animated 3D flag blowing in the wind that can depict the flag of over 50 nations but can also show any logo you care to choose from an image file stored on your computer. You can select your own background music too! Download Trial version. I tend to think of this one as the Mary Celeste screensaver. A vessel in full sail is ploughing through the ocean waves but... there appears to be no one aboard! Very mysterious. This is a simple screensaver with good lighting effects that should work well on lower-powered computers. Download Trial version. Relax with a Bacardi (or whatever takes your fancy) whilst this tropical lagoon paradise helps melt away the stresses of the day. Download Trial version. Despite the excellent lighting and reflection effects in this screensaver it works really well on even low-powered computers and, best of all, it's FREE. A beautiful lighthouse stands alone amidst stormy seas as a beacon to passing ships warning them of the nearby treacherous rocks. Download Trial version. Two thousand years ago a mighty Mayan city once thrived here. Now, overgrown with jungle, I'd almost expect to see Lara Croft or Indiana Jones running by looking for ancient artefacts, but only the sounds of a cascading waterfall and the jungle wildlife disturb the silence. Download Trial version. Leave the rat-race behind and take a well-earned break in this secluded mountain hideaway. Also works as animated Active Desktop wallpaper. Download Trial version. There are no irritating people to disturb you and nothing man-made to spoil the view in this screensaver. Just plants and trees blowing gently in the warm breeze, the bubbling of a stream, majestic mountains and fish, bird and insect life enjoying the harmonious tranquillity. Mother nature in all her glory. Download Trial version. Follow in the wake of Captain Nemo and patrol the ocean depths encountering sunken cities and wrecked galleons in your adventures. Download Trial version. "Ash nazg durbatul�k...!". The One Ring from Tolkien's Hobbit and Lord of the Rings fantasies is lovingly depicted here spinning above a beautiful 3D relief map of Middle Earth. FREE. If you've looked at the Fantasy Moon screensaver above, this is what I imagine the strange little house depicted in that screensaver might look like inside. A roaring fire is blazing in the hearth set between the twisting trunks/roots of a tree. On the mantle piece, a mantle clock ticks methodically and a picture frame displays any picture you choose from an image file on your computer. Download Trial version. Step back in time 65 million years to the late Cretaceous Period and watch not just the infamous T-Rex but a whole menagerie of prehistoric animals prowling the land and soaring through the skies. Download Trial version. August, 1492. Join Christopher Columbus aboard the Santa Maria, Pinta and Santa Clara, and set out on a daring voyage of discovery through howling gales across the Atlantic Ocean. I especially like this screensaver as it has very lifelike wave and water motion, each of the three ships has a visible, animated crew and the lighting changes in real time from dawn to dusk. Download Trial version. A beautiful rustic watermill in a forest valley setting. Just sit back, relax and listen to the churning water and sounds from the forest. Download Trial version. Amazing 3D recreation of an American 4-4-0 steam locomotive that was one of the most popular types of trains in North America during the 1800's. Hitch a ride on the railroad through small western towns, industrial areas, mining communities, cuttings, tunnels and across viaducts. I have no interest in trains at all but I bought this one myself; it's that impressive. Download Trial version.